2019 Nitro Z21 Pro Package with a Mercury 250 PRO XS four stroke. 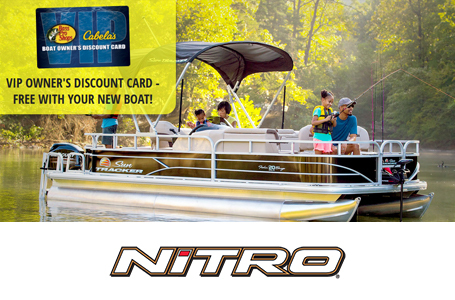 With the exclusive NITRO® Z21 Pro, you get our most popular high-performance upgrades at an exceptional value! The NITRO® Z21 Pro comes factory-rigged with a powerful Minn Kota® Ultrex® trolling motor to make moving the boat effortless. You also get Humminbird® HELIX™ fishfinders to help you find the fish, and now two Minn Kota® 10' Talon shallow-water anchors lock you down when you get there! Beam: 7 ft. 11 in. Bottom width: 6 ft. 2 in. Max. person weight: 825 lb. Average dry weight: 2150 lb. Average package weight: 4050 lb. Towing length: 27 ft. 11 in. Storage length: 24 ft. 4 in. Humminbird® HELIX™ 9 SI G2N w/GPS. (RAM® mounted). Humminbird® HELIX™ 10 SI G2N w/GPS. (RAM® mounted).